Heat oven to 375°F. Spray two 11x7-inch glass baking dishes with cooking spray. In medium bowl, toss shrimp and scallops with 1 tablespoon of the oil and generous pinch of the saffron threads; cover and refrigerate. In 4-quart Dutch oven, heat remaining 1 tablespoon oil over medium heat. Cook garlic and onions in oil about 5 minutes, stirring frequently, until onions are crisp-tender. Stir in tomatoes, artichokes and sausage. Cook 2 minutes, stirring frequently. Stir in rice. Spread half of rice mixture evenly in each baking dish. In 2-quart saucepan, heat broth, paprika and 1 teaspoon saffron threads to boiling. Pour 2 cups broth mixture evenly over rice mixture in each baking dish. Cover with foil. Bake 35 minutes. 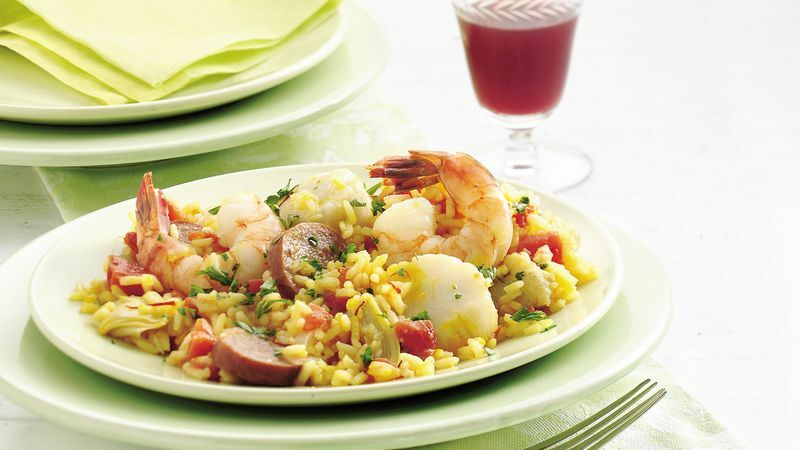 Place shrimp and scallops on rice mixture in each dish. Cover and bake 15 to 20 minutes or until shrimp are pink and scallops are white and opaque. Sprinkle with parsley. Paella originated in Valencia, Spain, and is named for the special wide and shallow pan used in the traditional preparation.